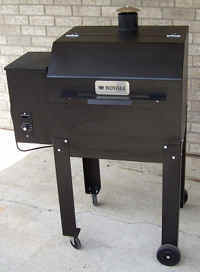 Royall pellet grills, built in Wisconsin, are aimed at the budget 'no-frills' end of the market. 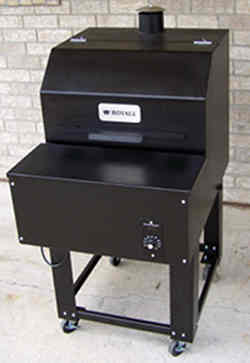 They do have automatic ignition, and come as standard with a three position temperature controller. 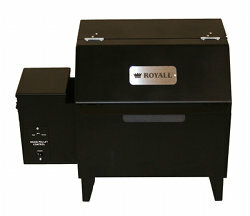 Royall pellet grills are built of 14 gauge steel which is powder coated for high temperature durability. Cooking area 270 sq. ins. Dimensions H 21" W 28" D 18"
Temperature control Three setting analogue, a ten position digital (Low voltage) control is optional. 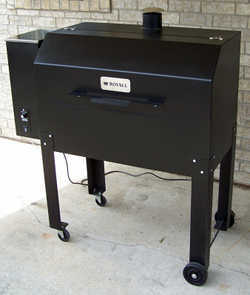 Dimensions H 48" W 24" D 31"
Cooking area 418 sq. ins. 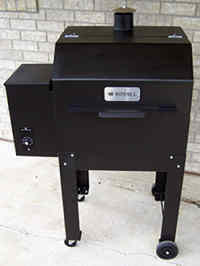 Dimensions H 46.5" W 34.5" D 21.5"
Dimensions H 48" W 31" D 24"
Here's a two minute video showing Royall pellet grills in action.